Rock legend Robbie Robertson and actor Michael J. Fox were among 43 people invested with the Order of Canada at a ceremony at the Governor General's residence, Rideau Hall, in Ottawa. Rock legend Robbie Robertson and actor Michael J. 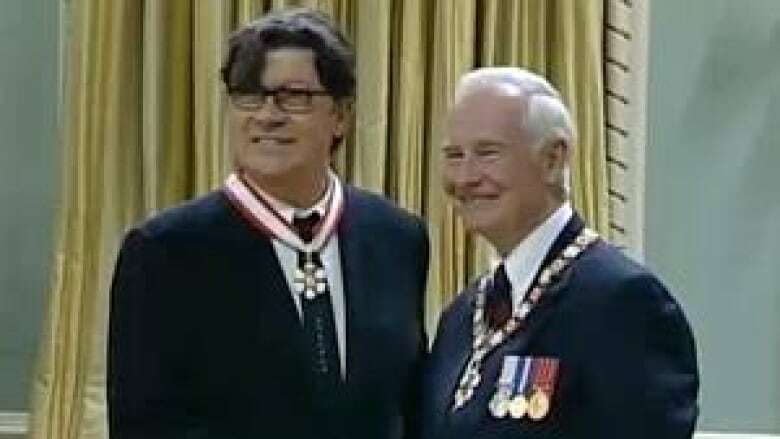 Fox were among 43 people invested with the Order of Canada at a ceremony at Rideau Hall in Ottawa on Friday. Robertson began his rise to stardom as a member of The Band, later embarking on a successful solo career that broadened to include film scores, acting, producing and musical collaborations. "Through a fertile blending of diverse musical styles, he has introduced native music to a much wider audience," the Governor General's office said. After the ceremony, Fox talked to reporters at Rideau Hall about his work with the Michael J. Fox Foundation for Parkinson’s Research. The Canadian branch of his foundation recently gained charitable status. "When we started the foundation we didn't want to be just a symbol of hope but an agent for change," he said. B.C. native Fox, who has dual Canadian-U.S. citizenship, is perhaps best known for starring in two television series, Family Ties and Spin City, as well as the Back to the Future movie trilogy. He was described as a "respected and accomplished screen actor," but also "an outspoken advocate" for people living with Parkinson’s disease. The actor went public with news he had Parkinson's in 1998. "It's a seriousness and a sense of humour. It's a lot of contradictions. It's an intensity and also an enjoyment of life and a recognition of the simple pleasures of life and our importance to each other. When I think about Canada, I think about vast spaces and tight communities and that, I think, was representated in what we heard today and the people that were represented here. They come from all over the country and all different communities, but they're tightly connected." Former Toronto Maple Leaf and Hockey Night in Canada commentator Howie Meeker also received the country's highest civilian honour. From 1973 to 1977, the CBC's Howie Meeker Hockey School — with its 15-minute episodes — showed off Meeker's knowledge and enthusiasm to Canadian kids as they learned the ins and outs of the game. "It's really an honour to join a lot of very important and talented people who have won the same award," said Meeker, who was born in Kitchener, Ont., but lived for 30 years in New Hamburg, Ont., where he said he dreamed "one day, when he was on the pond," of playing for the Leafs. When asked about receiving the honour, Meeker called Canada the "greatest country in the world," adding, "It's full of neat people." In total, Gov. Gen. David Johnston presented 29 members and 14 officers with their insignia of membership. Meeker was named as a member of the Order of Canada, a title recognizing service to a specific community or area of expertise. Robertson and Fox are both officers, an honour earned for service to Canada or humanity at large. The highest designation is a companion to the Order. Robertson later told reporters he feels "very proud of Canada today." He added that while there is a lot more work to be done, there is a general feeling that more progress is being made in Canada than in other countries regarding the well-being of aboriginal people. Other new members include women's rights activist Erminie Cohen; Kue Young, a leader in the field of aboriginal health research; and Donald Julien, a lifelong champion of Mi’kmaq heritage. Among the newly named officers were former federal justice minister Anne McLellan and former federal health minister Jake Epp. A posthumous award of officer was on the recipients' list for criminal defence lawyer Harry Walsh. He played a key role in advocating the removal of the death penalty in Canada.